Manila, Philippines- PAGASA advised 12AM on Thursday, November 7, 2013 that Super Typhoon Yolanda has entered the Philippine Area of Responsibility (PAR) or was located based on all available data at 943 km East of Hinatuan, Surigao Del Sur (8.2°N, 134.9°E). Bagyong Yolanda has a maximum sustained winds of 195 kph near the center and gustiness of up to 230 kph. It is forecast to move West Northwest at 30 kph. MINDANAO: (Surigao Del Norte including Siargao Island, Dinagat Island, Surigao Del Sur, Agusan Del Norte and Northern part of Agusan Del Sur ). Typhoon Yolanda is the 24th typhoon to hit the country this year with International name 'Haiyan'. 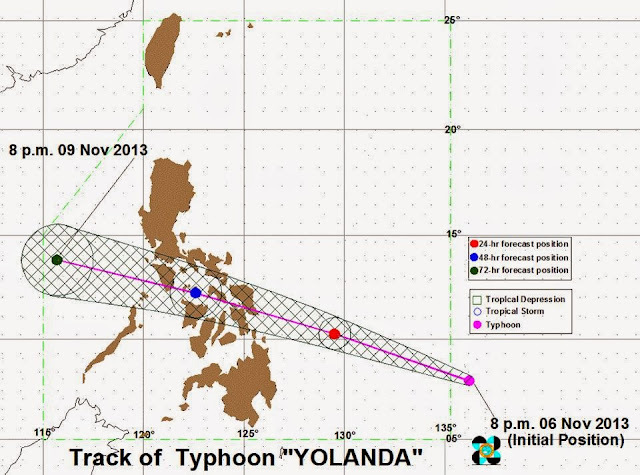 International weather agencies have already labelled Yolanda as a super typhoon. The weather bureau said in the previous forecasts that Yolanda is expected to make landfall on Friday over Eastern Visayas or Samar-Leyte area and then barrel through the Visayas. The public and the disaster risk reduction and management council concerned are advised to MONITOR the weather condition and watch for the next advisory.